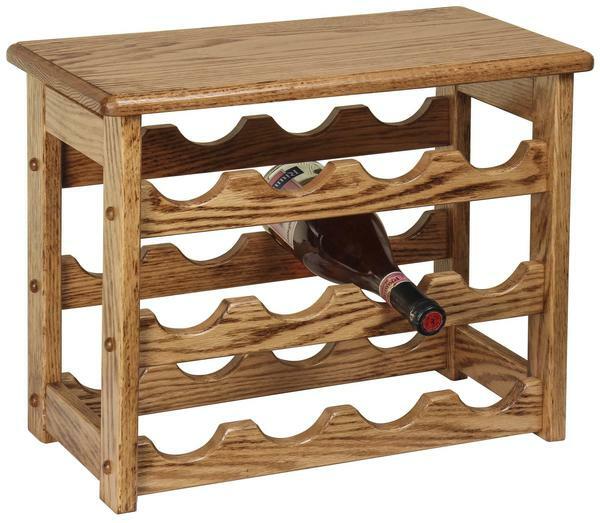 This Amish Hardwood Medium Wine Rack is a great way to provide extra storage for your wine collection. Have your wine rack custom built from either Oak (standard) or Cherry Hardwoods. Stock up on your favorite wines and display up to twelve bottles on this beautiful wine rack that was handcrafted by talented Amish woodworkers. The additional top shelf on this piece is a great feature because it can be used as a display or storage shelf to hold a variety of other items. All our products are proudly built by skilled Amish carpenters from their wood shops right here in the United States! 19 1/4" x 10 3/4" x 15 1/4"
Custom options for additional racks and columns are also available. Please Call to Inquire.